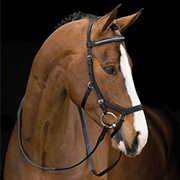 When it comes to bridles there is an overwhelming number of different options. You can have different nosebands, different bits, and even different types of headstalls now. The number of choices can make some people crazy, feeling like they need to try everything to see which magic combination will make their horse go better. Others stick with a plain nosebands and snaffle feeling like if you can't ride you horse in that, you need to ride better. I am not a huge believer in different gadgets, but I am willing to try new things, especially bits when it comes to jumping. For dressage I pretty much ride everyone in an oval link snaffle and a noseband with a flash. I had seen a lot of people using the Micklem bridle but, honestly, thought it was ugly and had no real interest in it until this summer. We had a group come in for a week and a lot of the riders were using Micklem bridles. I started asking them why and what benefits they saw using that instead of a regular bridle. They told me that their horses were much softer in the jaw and that it is sort of a self correcting bridle. They said when the horse tries to resist, by opening their mouth excessively, it puts pressured on their nose and encourages them to be more accepting of the bit. I found this very interesting and for the first time I wanted to try one. The horse I had in mind to try the Micklem on was Rosie. She is an ottb who can be a bit tight and sometimes to can be a little resistant in her jaw on the flat. She had always done well in dressage but I never felt like she was as soft in her jaw, and subsequently, over her entire topline as she should be. I was very happy to find out that Strafford Saddlery allows you to try out the Micklem and if you do not like it you can return it. This made trying the bridle worry free because it is expensive and you really don't want to drop that much money on something if it doesn't work for you and your horse. So I went to Strafford Saddlery and got a black cob sized Micklem to try on Rosie. The very first time I used it on her, I fell in love with it! Rosie was so much more soft and supple in her jaw and I was able to get her to lift her back and swing along much more freely in the trot. The results impressed me so much I decided I may as well try it on all of the horses I am riding. Union, the horse I am currently competing Intermediate, is also an ottb and he is very sensitive on the flat. His problems are usually more mental, he physically can perform very well, but often gets a little overwhelmed and becomes anxious. I have had to create a pretty unique way to warm Union up, where I basically trot and canter around on a loose rein, just to get him to relax in his own way. I was totally unsure how he would react to the bridle. As with Rosie, I loved riding Union in it. He felt so much more relaxed and more rideable. I was able to work on more lateral work and put a little more pressure on him without him getting anxious or worried. I can't say enough about how much this bridle has changed my work with Union on the flat. Now this bridle isn't for every horse, I tried it on a mare I am riding, Jumbie, and she hated it. She was so unsteady and was trying to be very heavy and she kept pulling down. Jumbie isn't as sensitive as the two thoroughbreds so I was pretty suprised that she really didn't like it. I wound up getting off and switching back to her regular bridle after about 20 minutes, I wanted to give it a fair try or I would have switched back sooner than that! I have heard some people say they think the Micklem clamps the horses mouth shut and looks really uncomfortable for the horse. I think this is totally false, the horses I have found it work the best on are very sensitive horses who would be much worse if their mouths were being clamped shut, they would be softer in the jaw. 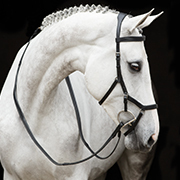 The bridle is supposed to be designed to work with the facial nevers and be better anatomically suited for the horses head. Overall, I am so happy I decided to put aside my skepticism with the Micklem and try it on a variety of horses. The two thoroughbreds have been doing much better and are moving more freely than ever before. If you have a horse that you think just needs to be a little softer or seems a bit fussy in the bridle, consider trying a Micklem! Daryl Kinney currently works for Denny and May Emerson at Tamarack Hill Farm. She went to Johnson & Wales University and rode with Tom and Joan Davis at Flatlands Equestrian Center. Now she competes several of Denny's horses, including Union Station, who she is planning on moving up to Advanced next year.